Autumn is the perfect time to plant onion sets, shallots and garlic, the soil is still warm from the summer and the days are still long enough to give high light levels. This collection of our best selling, best performing autumn planting alliums will give you an extra early harvest – up to 4 weeks earlier than spring planted varieties. Onion Radar – 250g pack (80sets) If you experience severe winters, try ultra-hardy Radar as it puts up with the worst of the weather much better than many older varieties. This outstanding performer has a mild and crisp flavour. 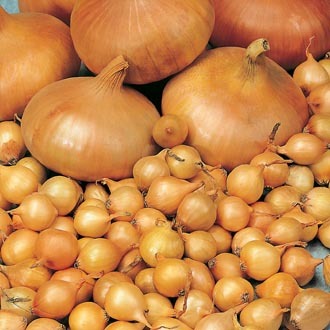 Shallot Jermor AGM – 25 shallots - The very best for flavour, Jermor is a true French longue type, bred in the southern Rhone valley. The copper skinned bulbs have a crisp, pink flesh, tinged white. It is a very popular exhibition variety, but it is equally popular in the kitchen for its excellent sweet taste. Stores well. Garlic Provence Wight – 2 bulbs - A really large, white softneck garlic which can produce, in a good growing season, bulbs that are of a similar size to Elephant Garlic! The cloves are fat and juicy.